I did a little bit of research on some of the things I had found, and here’s the scoop on the first 2 photos from yesterday, and the first one today. 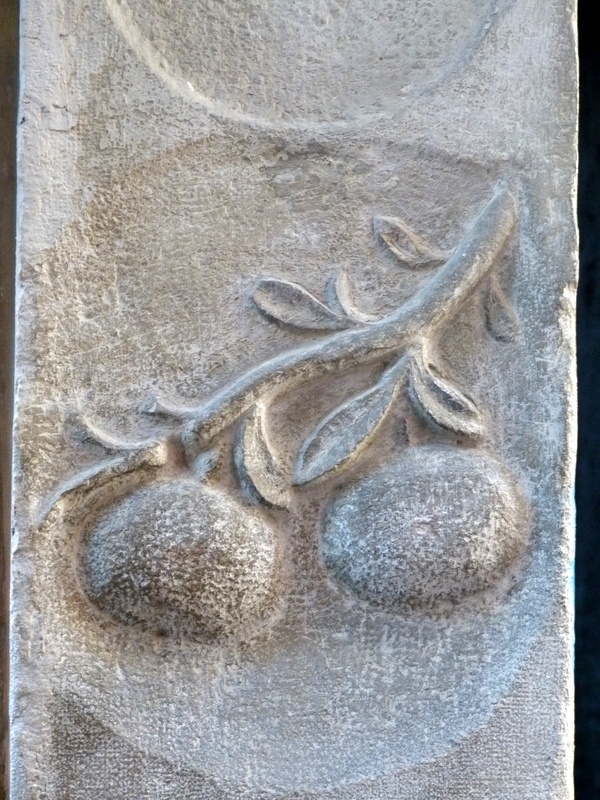 The carvings of 2 peaches were the symbols of the Confraternity of merchants of fruit and peach preserve! This photo shows similar fruit hanging from a branch. 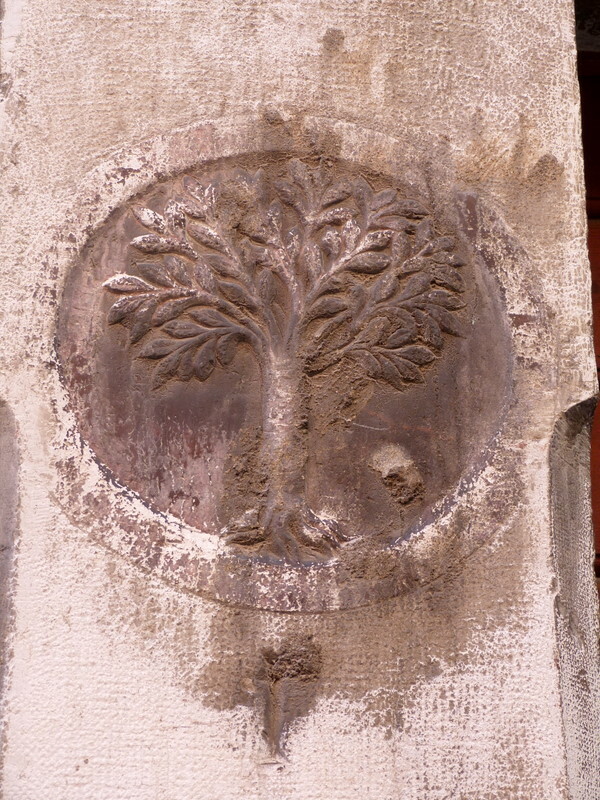 This carving represents a mulberry tree, and was the symbol of the silk-makers. 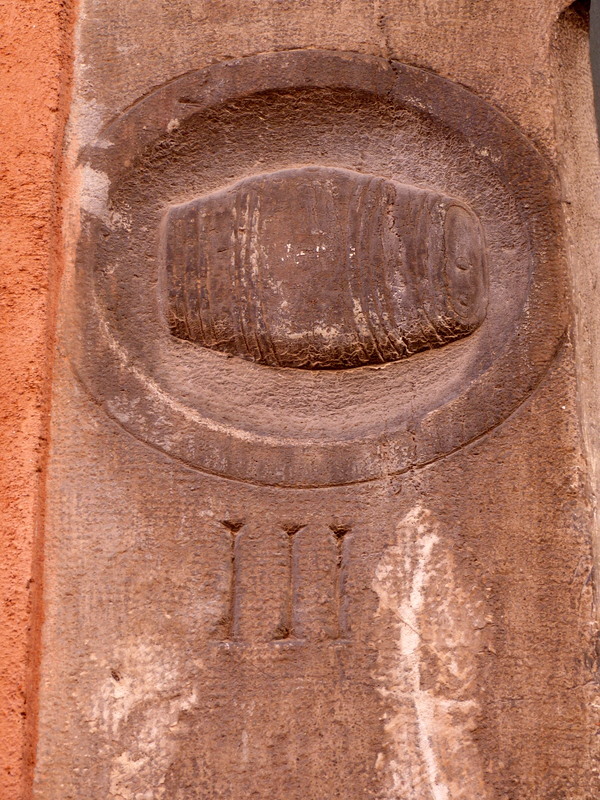 This is the symbol of the barrel makers (the boteri). Notice also the old house number. 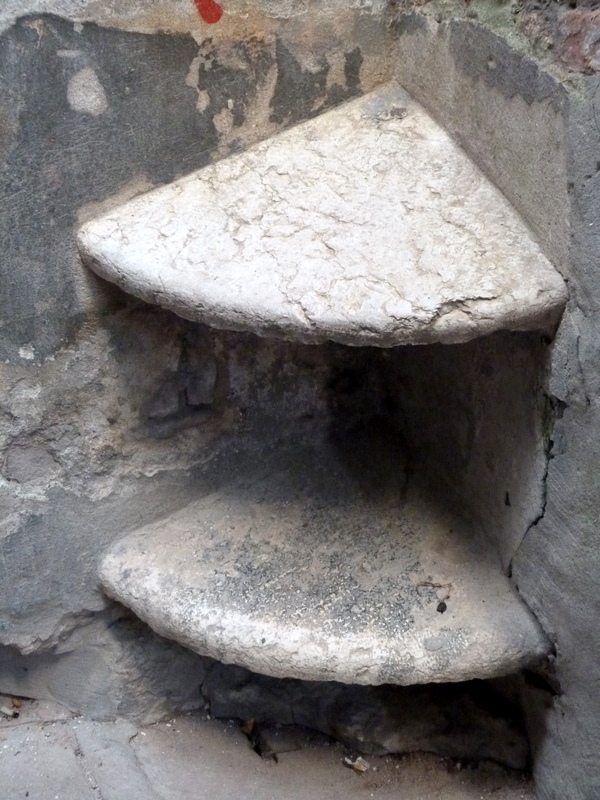 And, here a doorway especially shaped to allow barrels to be rolled in and out! 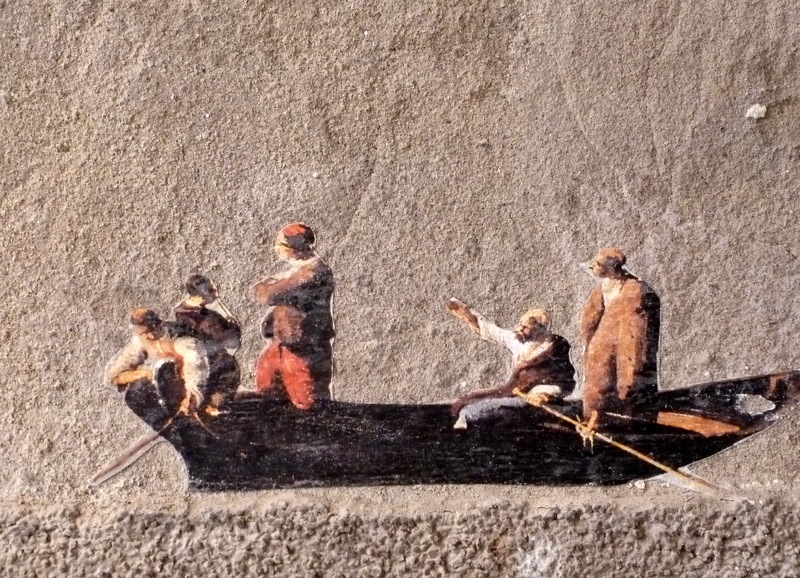 As promised, the other small boat graffiti, at the side of the bridge leading to the Coin department store, Cannaregio. And, a special find. 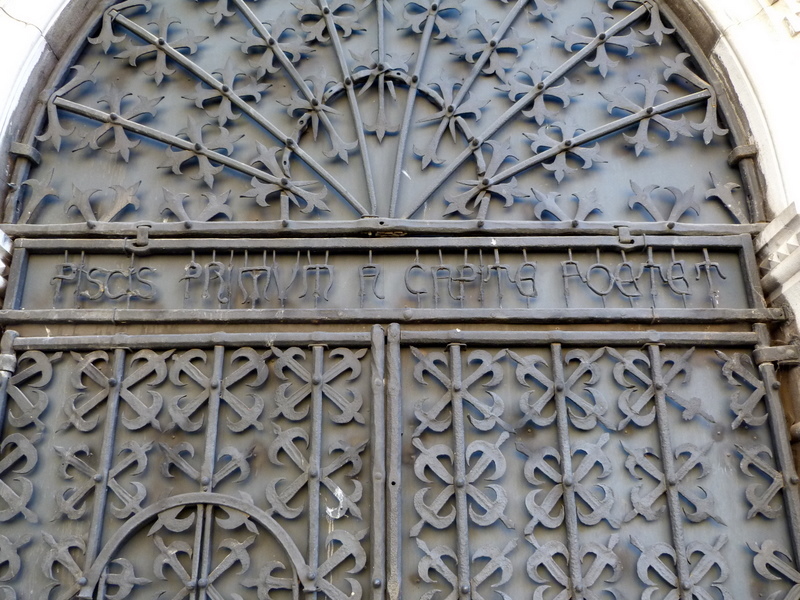 The writing reads : Piscis primum a capite foetet, or “Fish begins to stink from the head”! This is near the fish market, so could be a case of “buyer beware”. My beloved double-decker pissotta shyly revealed itself today, to my delight! Can you cope with more of this area? I have more treasures to share, if that’s alright with you? Thanks Yvonne – sounds very plausible. Yes, yes, yes. Send more! It’s pronounced coh-een. No, I find it troppo caro, and aimed at a different market! (Younger, smaller.) Oviesse, which I have seen in Treviso, is more main stream, and has clothes which will fit the branches, not the twigs, if you know what I mean. Only one more week of slavery for you folks. Ooh, thanks very much for the tip, Yvonne! I love your graceful simile of branches & twigs (although from the photos I’ve seen of you, you look more of a twig to me!). Off on a tangent, I only recently discovered that ‘tronchetto’ means ‘log’ (mentioned in the context of ‘Tronchetto di Natale’ for chocolate log), so I’ve been wondering how the car park island got its name? P.S. Yes, 1 more week at the grindstone – this is me up ready to start homework at 9am on Sunday morning (to get in an hour before the ‘Archers’ omnibus 🙂 ), but putting it off by enjoying your blog instead! Caroline, whenever one of my students asked me something I didn’t know, I’d answer “That’s such a good question. I’ll see if I can find out for you.” So, there’s my response to your curiosity about the Tronchetto here. Hmm. Who can I ask?? I had an email from another Venice Tragic, and here is his theory, Caroline. It sounds good to me! A lady hovering … LOL! I know I promised to behave, but that was too hard to resist. Well, if I leave openings for you, how can you resist! Some look newer than others…..LOL! I think you should write a book about them …….. Thanks Yvonne for these…… I love the double pissotta, where is it? As Melissa reported – torrential rain and flooding in Sthn Qld, Nthn NSW and Sydney, a record breaking heatwave in Perth and just hot everywhere else. And yes – I’m ‘over’ summer already! If you hover over the photo (not you, literally, but with your cursor! ), you’ll see where to find it, Mary. Please get rid of summer by 19 February. Thank you. Ah, what a delight to come home to! Love it. Keep it up, please. It certainly is an area jammed with symbols and surprises, Michelle. The other gondola is as cute as the first one. Thanks for posting it today. Someone went to a lot of work to make these little boats and their passengers, Suzzanna. I’ve read that Piscis primum a capite poetet, while literally true for fish, is a proverb aimed at businesses. Certainly a great find, Yvonne – I’ve never read of it in any book or on any other blog. If Linda does not know how to find where civic numbers are in Venice, just go to ombra.net and click on ‘Venice Civic Number’ in the column on the left. The rest is more or less self-explanatory. You only need to know that Yvonne was in the San Polo sestiere. And, to complete the picture re: the proverb, Bert, the offices of the employees of the local authority that runs the market are in the building where you would find that door. Did you have a good Aussie Day? Has the rain stopped? As long as your request doesn’t involve eating Vegemite or wearing Ugg boots, i might consider it! No Yvonne, we have floods again!!!! Did you get my email a couple of days ago? We have torrential rain, evacuations, power loss – the same poor people who copped it last year are copping it again. Have no fear, ugg boots are OUT, no self-respecting person should ever wear them outside the house, even inside is a bit of a stretch lol! However, Vegemite is Yummo! Although, I will admit it is an acquired taste. Oh, is that all! You may have to go to magazines and recipe books to get your food fix, though. Ah, yes, recipe books……….but who could capture Venice, Italy in photos better than you? You have a wonderful ability to capture extraordinary things that us normal people can’t quite achieve! I just yearned for a little glimpse of all those wonderful Venetian delicacies! Your beautiful Frittelle photos will suffice. FNQ has gone relatively unscathed since your departure, I am confident that upon your return you will find everything as you left it, fingers crossed! Happy Australia Day, Yvonne! I sent you an email with a small request. I left enough of the house number so you should be able to find it. It’s a shame about the scribbles all over the door. What brilliant discoveries!! Keep up the good work – it is a fascinating daily adventure! Thank you, Island Girl. They’re just small details, but so packed with history and charm. I’ve read about the barrel door before….but have never found it……. Share away, Yvonne! Perhaps you will also find the Guild of the Pissotta Builders! Seriously, Yvonne, you should ask around on who makes them! I don’t think they’re made anymore, Pat. They’re all ancient relics. Please share more treasures Yvonne! Those little boat graffitis are so beautiful, it almost seems a sin to call them graffiti! I have another one tucked away somewhere. I’ll find it and post it. 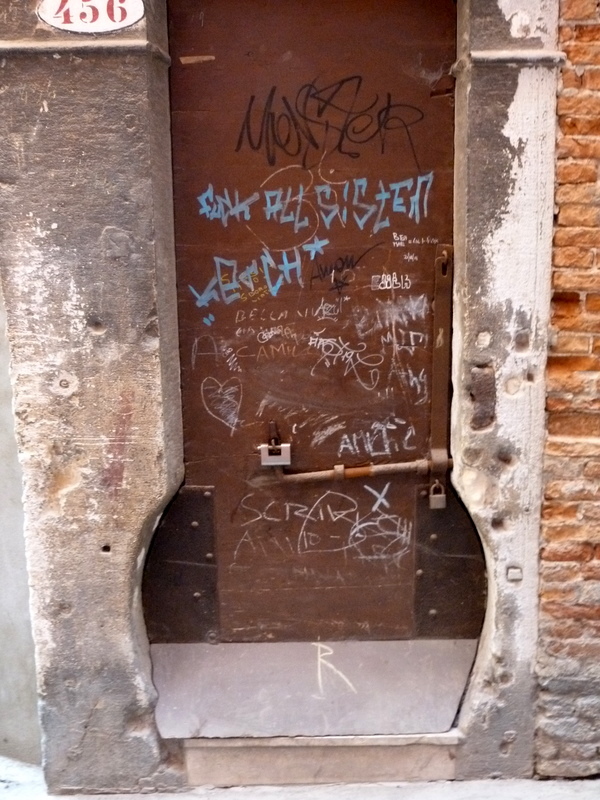 It was on Venice Daily photo, and one of the Venice experts was kind enough to tell me where to find it. My camera has become like a 5th limb these days, Joanne. Absolutely…..it’s fascinating. What an amazing tour you could run. Do you ever plan on giving tours? Every day would be totally different, Linda. I seldom have any fixed idea in mind when I pull the door shut behind me.